Looped ends on wet mops significantly add to their life and performance. These mops are also ideal for laundering. Tailbands improve coverage and control. This enables the mop to clean more area while saving time and money. Tailbands also prevent tangling, in use or laundering. Cotton Fiber mops are popular for their low cost, limited shrinkage, and great absorption. PRayon fiber mops both absorb and release quickly. 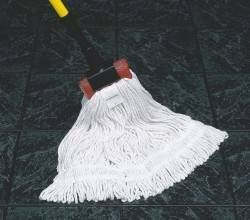 They are mildew resistant and are excellent finish mops. Blend mops combine all advantages of several different fibers to provide the ideal balance of price, performance, durability and appearance.